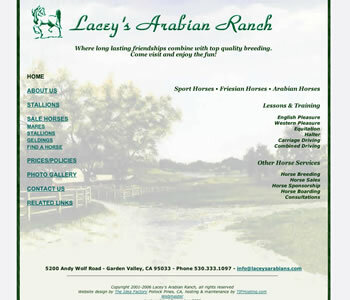 Lacey's Arabian Ranch is a beautiful Garden Valley ranch where you'll see gorgeous Arabian and Arabian mix horses, get lessons or training in a variety of horse related activities, or board your horse. They had a beautiful painting of their ranch which they wanted to be the backdrop for their website. Check out their site for the wonderful horses they offer for sale. We're pleased to have served Lacey's website creation and revisions since 2001. They have recently moved their website work in-house and we hope that works out well for them. If you'd like a website partner you can count on, contact us.